If nuclear weapons revolutionized international politics, as Bernard Brodie was first to argue, will they always have the same transformative effect everywhere? Or are their effects mediated or even overturned by specific regional conditions? The debate over the impact of South Asian nuclearization goes back to the mid-1960s, but grows ever less conclusive. Bhumitra Chakma, senior lecturer at the University of Hull, wades into this debate in search of commonalities, looking to reconcile rivalries in search of a consensus. The result is remarkably successful; mercifully succinct, but perhaps unsurprisingly discouraging. Chakma structures the book around the optimist/pessimist debate over deterrence. In Chakma’s treatment, optimists look much like Tolstoy’s happy families; they agree on the big forces and on the one big thing they’re sure will turn out right. Nuclear pessimists are more diverse, unhappy for different reasons, seeing so many things that could go wrong. This approach gives the book is greater universality. It is not just another book about South Asian nuclearization. It will also be very useful to anyone who thinks about nuclear stability. As Chakma shows, South Asia no longer can be understood as a derivative region, where tendencies developed elsewhere are played out. It has developed it own independent dynamic, originating problems and responses with implications everywhere else. This makes it a crucial element in the second nuclear age, the thesis about discontinuity from the Cold War era that he accepts. Chakma goes further, describing South Asia as a laboratory for the future of nuclear deterrence and security. He makes a persuasive case. The book rests on the presumption that ‘India and Pakistan are typical cases of horizontal nuclear weapons proliferation’ (p. 15). Certainly there is more about South Asian that is normal than there is for the Middle East or Northeast Asia, where nuclear programs seem far more idiosyncratic. One area where South Asia stands out is the burgeoning literature on its nuclear weapons and deterrence, a more and more a field plowed exclusively by regional specialists. One of the accomplishments of the book is to digest this increasingly unmanageable field and situate it within the broader research on nuclear deterrence and arms racing. 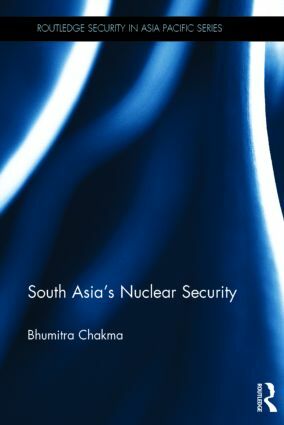 Chakma’s meticulous reading and systematic review is a valuable contribution in itself, an excellent introduction to South Asian nuclearization studies. A committed Aristotelian, Chakma is unhappy with the excesses of optimists and pessimists alike. The former underestimate the risks inherent in the India-Pakistan nuclear confrontation; they confuse the past with the future. The latter are too obsessive about risks and miss the restraint both countries have shown. Nuclear weapons, he argues, are here to stay. ‘The challenge,’ he writes, ‘is to reconcile the positions of the two schools and devise a middle ground in order to enhance the nuclear security of the region’ (p. 8). Rather than pursue a hopeless quest for regional disarmament, it is ambitious enough to aim for stable minimum deterrence. But the events and revelations of the past year- including new missile tests, assessment of the scale of Pakistani fissile materials production and the launching of India’s first SLBM – show that even this will not happen by accident. The book shows that nuclear deterrence has had an effect in South Asia since 1982, when Indian leaders considered an attack on Pakistan’s Kahuta enrichment plant, but Indira Gandhi decided it was just too dangerous. Consistent with the optimist argument, during the era of nuclear opacity, until the tests of 1998, South Asia experienced a series of deterrence successes. Even the very frightening Kargil crisis of 1999 remained limited. The most dangerous period, Chakma shows, was the 2001/02 Twin Peaks stand-off, when American mediation probably saved the day. Since then both sides have placed more emphasis on war avoidance, regardless of provocations. Chakma shows that much of the policy advice for South Asia is based on aging assumptions. Programs based on disarmament are simply out of touch. Minimum deterrence, still the most intriguing alternative, was most popular immediately after the 1998 nuclear tests, when Indian and Pakistani leaders were unsure of what they had done and sought to reassure everyone, including themselves. Bigger ambitions, however, quickly won out. Especially with Pakistan’s reliance on first use options, and the stalking horse role of China, minimum deterrence never had natural momentum. After developing slowly after 1998, the pace of force development accelerated in both Indian and Pakistan. Chakma described their current acquisition strategies as ‘maximalist’ (p. 32). The situation is an arms race, a mutually conscious competition, even if less intense than classic examples. It also is less dangerous, he concludes, since ‘the arms race helps maintain crisis stability’ (p. 97). Where Chakma struggles most is fully understanding the role of forces outside the Indian and Pakistani states. Terrorist threats and systemic forces, especially the role of China, are major elements of the regional problematique. But how do they affect the stability of regional deterrence, crisis stability and the outlook for minimal deterrence? Those connections remain more elusive. The one externality Chakma can evaluate more clearly is the role of the United States. American diplomacy, he notes, has been instrumental signaling regional transformation and containing regional nuclear crises, especially Kargil in 1999 and the Twin Peaks Crisis of 2001/02, when America ‘played a key role in controlling the process of escalation’ (p. 116). One implication is American regional disengagement, a new unwillingness to intervene diplomatically in South Asian disputes, would be very destabilizing. Regarding his compromise solution to regional tensions, minimum deterrence, Chakma is less convincing. As a recommendation it looks sound enough, but it also may be too remote to be reassuring. He undoubtedly is right about its advantages, but when even the smallest bilateral contacts are frozen and multilateral institutions are used exclusively to play gotch-ya, it is hard to imagine how even informal arms control ceilings could be arranged. All these are problems he readily acknowledges. Little wonder that Chakma concludes on a pessimistic note, supporting the logic of minimum deterrence, but lacking a ready solution to the ‘potentially ruinous competitive arms build-up… There is little reason to optimistic’ (pp. 148, 153). Reviewed by Aaron Karp, Old Dominion University. The book can be purchased via the website of the publisher.